Bayer ADVIA 120 Hematology Analyzer (Bayer Diagnostic Division (Siemens), Tarrytown, NY, USA. 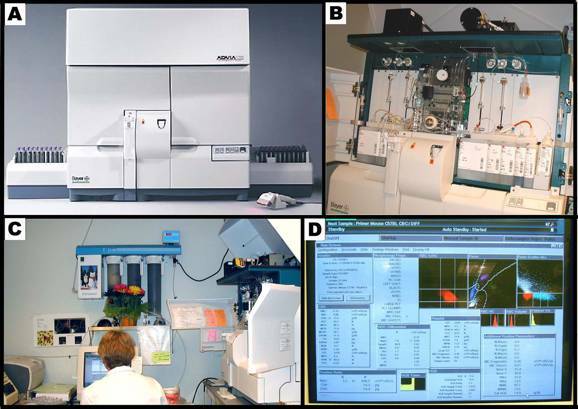 Panel A shows the Bayer ADVIA 120 hematology analyzer system. Panel B shows the internal layout of the ADVIA, and the various reagents used in the system. 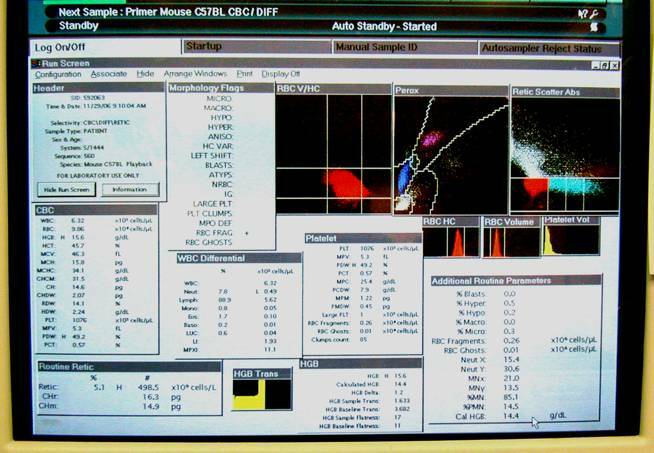 Panel C shows the hematology setup, equipped with a computer and a printer. Panel D shows a typical computer screen-output. In general all mice are brought into the procedure room and are tested within 1h. a. Mice at 6-7.5, 12-13.5, and 18-19.5 months of age are fasted for 4 hrs (7:30 to 11:30 am) before they are bled. b. Body weight measurements are recorded just before blood samples are drawn. c. 270 µL of blood sample (about 11 drops plus one capillary tube) is collected via a retro-orbital bleed using a heparin-coated capillary tube directly into BD Microtainer tube coated with lyophilized K2EDTA. d. The freshly drawn blood is quickly and gently mixed with the anticoagulant using a toothpick. Vortexing or inverting the sample is not done in order to preserve the proper ratio of anticoagulant to blood and also to preserve the integrity of the Red Blood Cells. a. Approximately 210 µL of un-clotted whole blood is transferred to a 2nd microtainer and is analyzed using the ADVIA 120 hematology system according to manufacturer's protocol. b. For additional information see The Aging Center at The Jackson Laboratory. Submitted measurements: White blood cell count (WBC), red blood cell count (RBC), neutrophil count (NEUT), lymphocyte count (LYMPH), monocyte count (MONO), eosinophil count (EOS), basophil count (BASO), large unstained cell (LUC), and reticulocytes (Retic) count, % neutrophil, % lymphocytes, % monocytes, % eosinophils, % LUC, % basophils, mean platelet volume (MPV), and platelet (PLT) count; red cell parameters including hematocrit (HCT), hemoglobin (HGB), mean RBC corpuscular hemoglobin content (MCH) and concentration (MCHC), mean RBC corpuscular volume (MCV), % reticulocytes (Retic), and reticulocyte corpuscular hemoglobin content (CHr) for 6, 12, 18, and 24 months old mice. This figure illustrates a close-up display of the computer screen result in Panel D above.